Yesterday was the baby shower for a good friend. Her name starts with an M, as does her yet-to-be-born baby girl. Pink was required, and dragonflies are the nursery theme, so I decided to combine the two. The new mom is a vegetarian, so I had originally planned to make some kind of fabulous non-gelatin strawberry bavarian cream layered masterpiece, but anyone who has read my baking disaster post about agar agar knows I have not yet conquered the sea vegetable beast. When I regrouped and went a different direction, I kept seeing raspberry and white chocolate, since I knew I'd be making white chocolate dragonflies. The cake is really a combination of 3-4 recipes. The white cake layers come from Dorie Greenspan's Perfect Party Cake from Baking: From My Home to Yours, which really is perfect (I've blogged it in March 2008 and July 2009 in various versions I've made). This time I made the cake layers according to the recipe, so they were light and slightly lemony. I wanted white chocolate in the cake as well, so I made the white chocolate whipped cream that is part of the Black and White Chocolate Cake in the same cookbook. 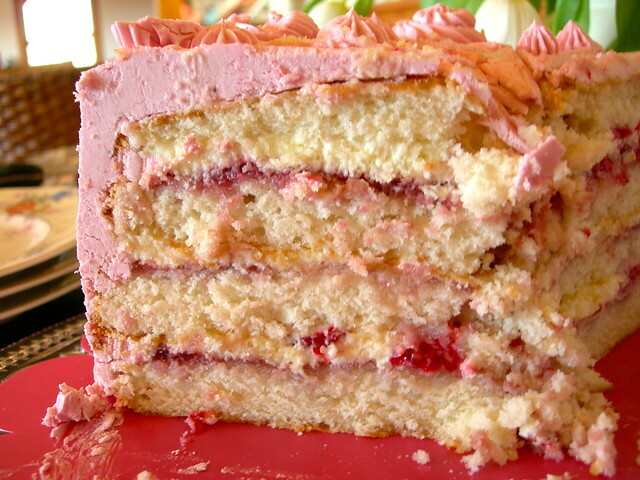 When I assembled the cake, I split the layers, spread each with raspberry jam, topped that with white chocolate whipped cream, and sprinkled that with fresh raspberries. 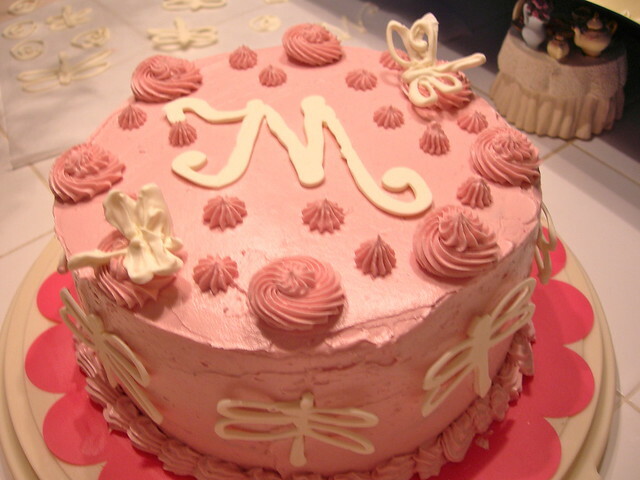 I made the raspberry buttercream from The Modern Baker by Nick Malgieri, and that's the color you see on the cake. No food coloring, just raspberries! The white chocolate dragonflies are just melted white chocolate discs that I stuck in a ziploc and piped onto parchment paper lining bent to let the wings stand up. 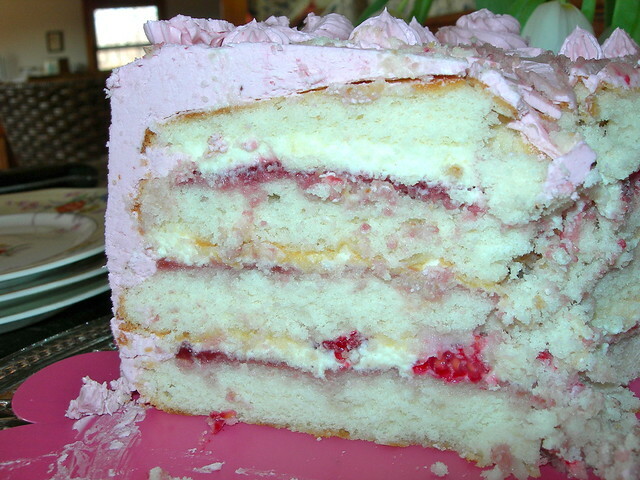 Overall, I think the fresh raspberries in between the layers as well as in the icing really clinched the flavor. 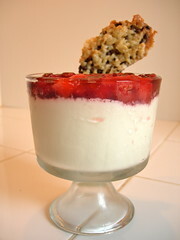 I am pretty certain I have made florentine cookies before, but I knew I'd never made panna cotta. There is always a subset of bakers who do alternative versions of the recipes, veganizing them, or making them gluten free. I decided this would be the month I would conquer agar agar, a sea vegetable that is often used in place of gelatin in recipes, making it vegetarian where gelatin is not. Well, it was a great idea. I could not find the agar agar powder anywhere, and figured agar agar flakes were close enough. Well, that's not exactly the case. Agar agar powder can be handled almost exactly the same way as gelatin, sprinkled over water, and so on. The flakes do not dissolve nearly as well. So for my first attempt I made panna cotta based on Giada De Laurentiis's panna cotta recipe, substituting coconut milk for the whole milk and adding a cinnamon stick to the simmering cream. 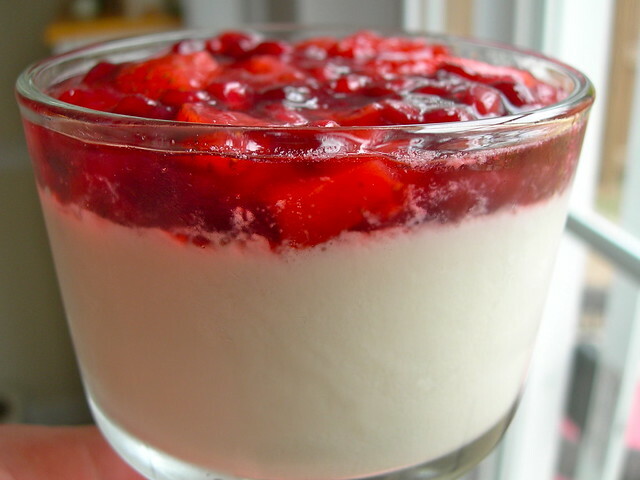 The agar agar flakes just never really dissolved, in either the pomegranate-strawberry gelee or the panna cotta. The fruit mixture had more of a gelled texture, but I imagine that was the pectin naturally in the berries, rather than the agar agar setting anything up. It was a soupy, loose-pudding gloppy mess. The flavor was good, but it was difficult to get past the texture! Attempts #2 and #3 were even worse. This time I decided to try a chocolate panna cotta recipe from Epicurious.com, cutting back on the sugar as Mallory recommended in the challenge. At this point I had asked for help in the Daring Bakers forums, and Audax, baking genius, had recommended boiling the agar agar flakes in water for 12 minutes or so before adding them to the mixture. I tried this, keeping it at a rolling boil, and a skin of the agar agar would colllect at the sides and top of the mixture. 8 hours later, I had achieved the texture of melted ice cream. I went to the Eden Foods website for more advice, and they recommended the 12-minute trick, also suggesting you could grind the flakes with a coffee grinder before soaking in water. For attempt #3, I soaked the ground up flakes in water for 5 minutes before boiling, and I thought I was getting somewhere, because they soaked up the liquid like gelatin does. I tried combining it with the mixture I'd already made that hadn't set up, but that resulted in the melted ice cream plus gelatinous string mixture you see pictured above. Ugh, I threw it away. I didn't really succeed at my challenge to make this work, but I really want to try finding the powder. It just should not be this difficult. We won't even speak of the coffee gelee I tried to make, which never thickened beyond being very sweet coffee. At least the Florentine Cookies were good. I didn't have corn syrup in the house, but I did have Golden syrup, so I used that in place of it and it worked just fine. Next time I'd definitely pull back on the sugar a bit, and maybe add some orange zest to the cookie or the chocolate. 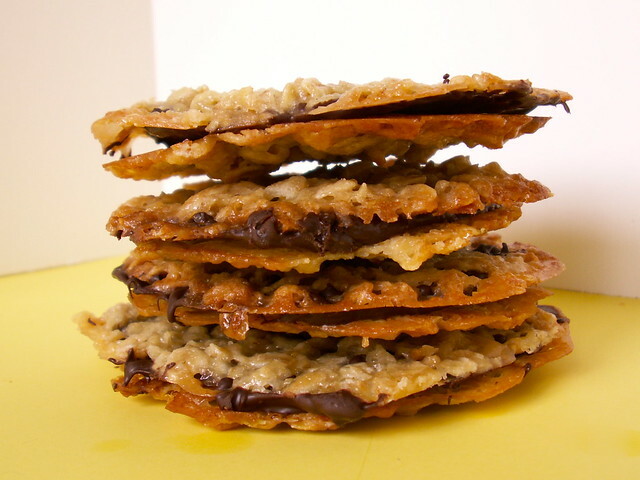 The recipe the Daring Bakers used was from Nestle, so you can try it too! I was first introduced to sfogliatelle by Alex Guarnaschelli on her show on Food Network called "Alex's Day Off," the Italian Dinner episode. Unfortunately, the Food Network posted for the pastries was severely edited and the reviews are terrible, so I wasn't about to try it, and wouldn't recommend you do either. In the ChowHound forums, as I prepared my trip to Philadelphia, I kept running across mentions of the Termini Bros. Bakery, a south Philadelphia institution that also has a stand in the Reading Terminal Market, which would be a block or so from my hotel. I saw that they had highly acclaimed pastries, including the elusive sfogliatella, so I added that to my list of things to track down. I went to the Market three times and never saw the pastry, because by the time I was there for lunch or in the afternoon, they were sold out. The last day I was there, I was in the Market for a committee meeting brunch, and snuck over to the Termini Bros. They had half a tray of sfogliatelle left, so I bought two to take home. 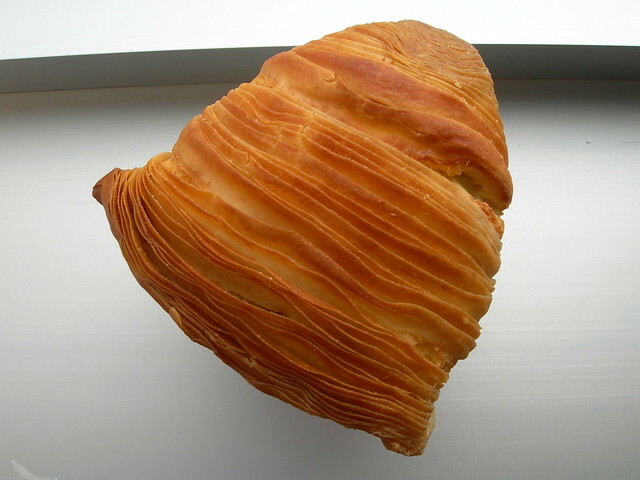 Sfogliatelle (is that plural? I confess my Italian isn't good) are interesting as pastries go. The outside is crisp with a bunch of thin layers, and it is filled with ricotta (the two I bought had a few pieces of citron inside as well). 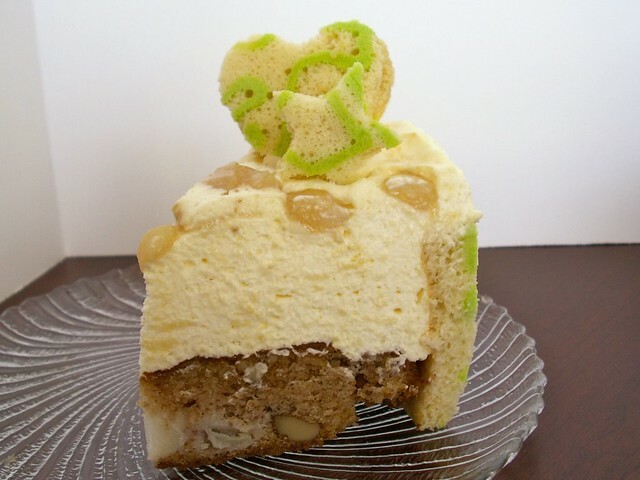 It is filling and not very sweet, but delicious. Definitely a distinct pastry, and I'm glad I got to try it. My co-workers got to enjoy assorted cookies from Termini Bros., which included fig bars, pignoli, macaroons, and amaretti, all of which smelled delicious. They also had beautiful cakes and torrone in the case. If you end up in the Reading Terminal Market, or near any of their four other locations in Philadelphia and New Jersey, they are definitely worth a visit! Er... it was. I had returned home from Philadelphia the night before, so I asked for an easy Valentines Day. I said I would make dessert, and skimmed through Twitter for inspiration. 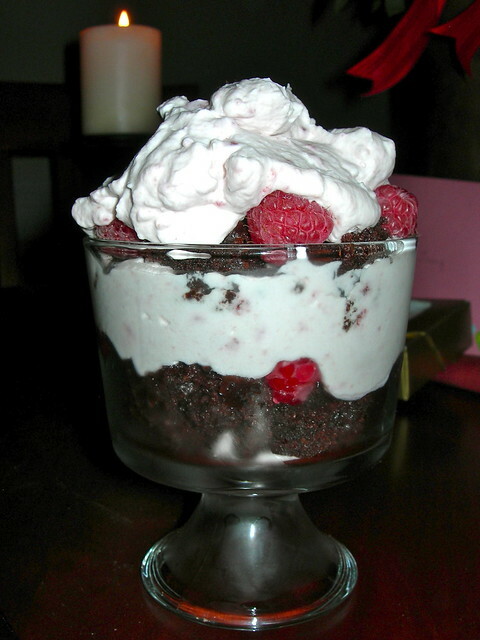 I came across this post for Berry Brownie Trifle from Two Peas and Their Pod, and knew it was meant to be. Yes, it was easy. But also tasty! I made brownies from a box (gasp) and added raspberry jam to whipped cream, but at least I whipped it from scratch. Those mini trifle dishes are deceptively huge inside. We had leftovers for later in the week. Sometimes, it doesn't have to take all day to make a holiday special. And sometimes, someone else's idea is worth using! Better late than never. I had everything purchased to make the January Daring Bakers Challenge, but ended up out for the count with a bad cold for an entire week! I wasn't going to let it all go to waste though, and finally made it over the weekend. 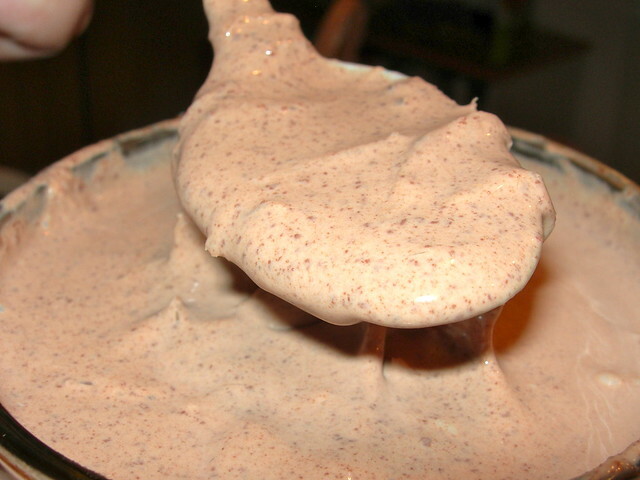 The January 2011 Daring Bakers’ challenge was hosted by Astheroshe of the blog accro. She chose to challenge everyone to make a Biscuit Joconde Imprime to wrap around an Entremets dessert. You can read the challenge and original recipe in its entirety on her blog. I always see pears in the store in January, so I decided to take that flavor and run with it. I found a recipe for Pear Walnut Spice Cake by Gale Gand, topped it with a cinnamon bavarian cream of my own creation, and topped that with a carmelized pear. In my vision of this dessert the carmelized mixture formed its own layer on top, but my bavarian cream was too delicate and the heat melted it. I was lucky to end up with it still looking moderately okay after being thrown into the freezer. 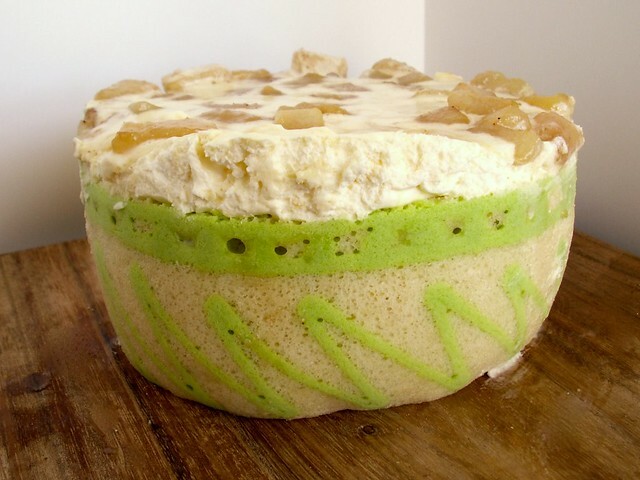 It was a nice flavor combination, although with the joconde it ended up being like double-cake. 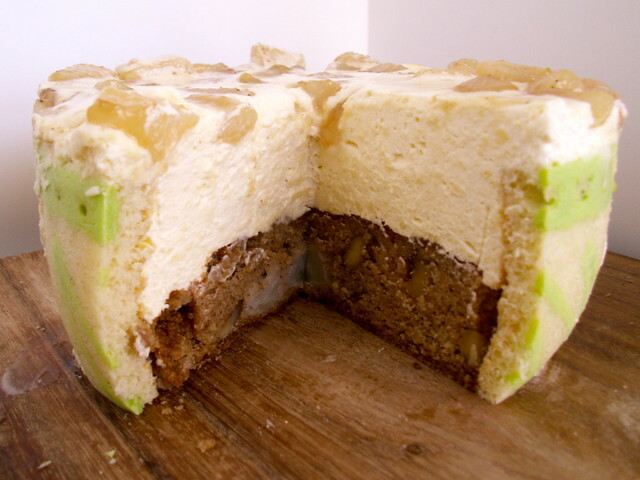 The pear walnut spice cake was a bit heavy inside, and while it tasted good, this would have been better with a mousse or another bavarian cream. I do think this skill is a useful one, and really enjoyed making the decorative biscuit joconde imprime.